If you’ve ever read “Freakonomics”, there is a chapter analyzing how certain words in real estate listings are correlated with either higher or lower sale prices later on. Essentially, words that are used to describe specific attributes – for example, “granite countertops”, “new hardwood floors” or “remodeled bathroom” – are highly correlated with higher sale prices. On the other side, adjectives that really don’t describe anything in particular, such as “charming” or “quaint”, are associated with lower real estate prices – they’re really just B.S. Check out the adjectives for Joakim Noah that we keep seeing: “high energy”, “simply a winner”, “has presence in the locker room”, “hard worker”, “gym rat”, etc. Those certainly aren’t bad descriptions – it’s a good thing that Noah isn’t described as being a loser or a lazy player. However, it’s more of the lack of the concrete descriptors that bothers me, such as “scores well in the post”, “hits 10-15 foot jumpshots with consistency” or “makes more than 75% of his free throws”. Joakim somehow has a reputation as a good defensive player, but it’s not as if though he’s really a shut-down defensive post player or talented shot-blocker. Noah is like one of those real estate listings that has a lot of amorphous B.S. adjectives without giving any indications of the concrete attributes. 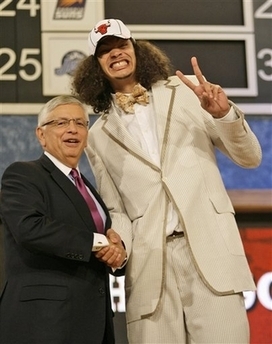 I’ll be honest – I never was a Joakim Noah fan while he was in college. That being said, I’m also not one of those guys that’s going to hold disdain for a player while he was in college against him when he joins one of my favorite pro teams. I mean, former Michigan Wolverine Anthony Thomas was the central culprit in the most scarring sporting event that I have ever witnessed live in person, yet I gladly took his NFC Offensive Rookie of the Year performance a couple of years later as a member of the Bears in leading the team to the playoffs. Joakim was definitely annoying with the Florida Gators, but it’s not as if though he ever reached a J.J. Redick level of hatred for me. The problem, though, is that the Bulls already have an abundance of severely offensively-challenged big men with Ben Wallace and Tyrus Thomas. With the Bulls in pretty good position to challenge for the top spot in the Eastern Conference this season, this would have been one of those times where they should have drafted for need as opposed to who they might have thought was the best player on the board at the time (besides, after Greg Oden and Kevin Durant, the next 10 or 15 players were essentially rated the same). Spencer Hawes, despite having the complete goofy lanky white guy look perfected by Brad Miller, would have been the better pick here (and it’s not as if though that would have been a stretch considering that he went only one pick later to Sacramento). Of course, what I’m hoping is that there is some method to John Paxson’s madness here. For me, that would mean that the Joakim Noah pick is a precursor to a big-time trade for Kevin Garnett or Kobe Bryant, either in terms of trading Noah himself or allowing the Bulls the flexibility to move Ben Wallace and/or Tyrus Thomas. (By the way, what’s up with Isiah Thomas getting some GM-sense, all of the sudden? That Zach Randolph trade was a complete fleecing by him. A few weeks ago, I was hearing the Bulls would have to give up Luol Deng or Kirk Hinrich if they wanted Randolph. After seeing the Knicks only have to give up Steve Francis and Channing Frye, though, I’m shocked the Bulls weren’t in the mix with an offering of, say, Andres Nocioni plus maybe Thomas.) If that’s the reason for the Noah pick, then I’m perfectly game for that scenario. However, if all three of Big Ben, Thomas, and Noah are still on the roster in the fall, I’ll be completely befuddled as to why this pick was made. At first I think a lot of us thought someone ELSE wanted Noah and the Bulls were picking at THEIR direction… like maybe the Orlando Magic had forgotten Billy D wasn’t coming to the Magic Kingdom after all and they were trying to surround him with at least one familiar face? However, as the minutes have become days it appears the Bulls have intentions on keeping Noah – at least short-term. I agree with the assessment Hawes would have been the best fit for need, although I consider him a work-in-progress for at least a couple more years so it depends on whether it is “need now” or “need future.” This may all work out for the best as the Bulls now have even more flexibility to deal for a more accurate, more experienced big man who might make more of an immediate, “win-next-year” impact than the very-green Hawes might have…that is as long as someone is in the market for an offensively-challenged but high energy guy!